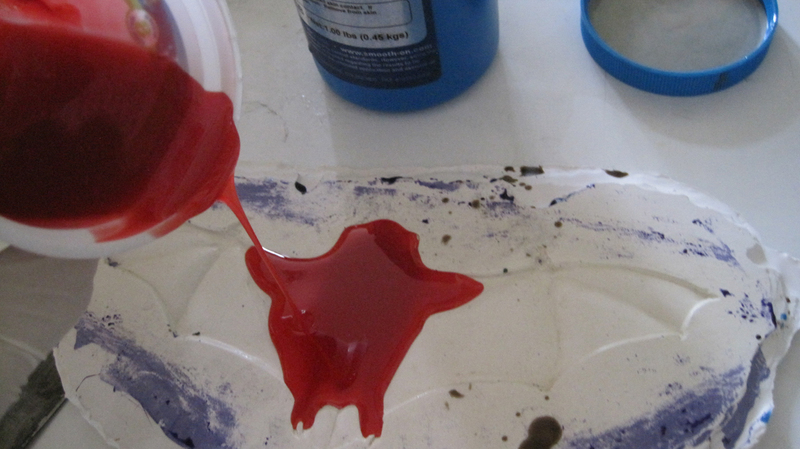 Sensational Questions About Tactile Art – What Works? This week I am posting a short audio clip, around seven minutes long, about what I am trying to learn from the audio interviews I am posting each month. I have lots of questions and I know some people who might know some of the answers. I want to back up for just a moment and talk about why I am doing these audio interviews. 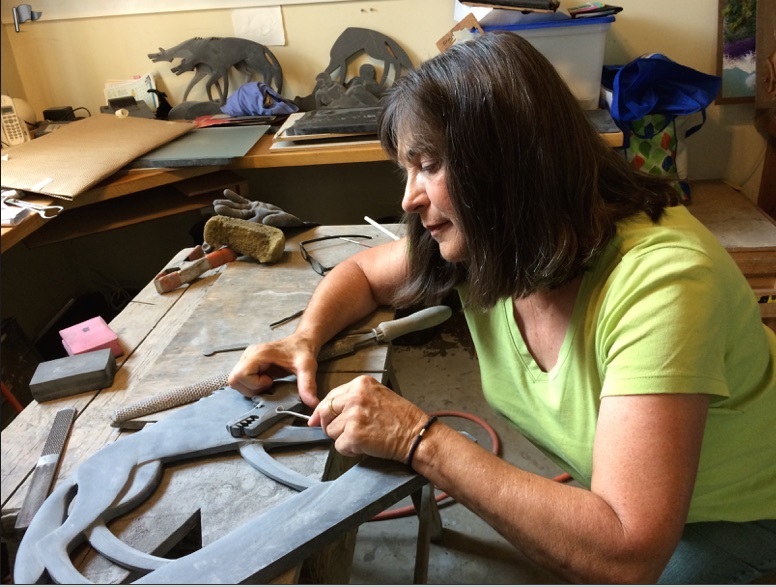 As I prepare for my exhibition at the Woodson Art Museum, I though it would be the perfect time to re-examine all the thing I think I know about tactile art. I started making tactile art in the early nineties because a question popped into my head. I was hanging a low relief sculpture in an exhibit and I found myself wondering if a person who is blind could figure out what the picture was through touch. I didn’t know anyone who was blind but I had the good fortune to be introduced to Tina Blatter, an artist who is blind. For the next five or six year we had a lot of fun sharing art work with each other and talking about what worked and what didn’t. One day she introduced me to Julie Deden, director of the Colorado Center for the Blind. I asked if I could show my work to people at the center and see if any of it made any sense. The answer I got was some parts do and some parts need work. I never was told to forget about it. In fact I was always energized by the the conversations we would have. A short time later I began teaching art classes at the Center and have been ever since. It took a while but eventually I unequivocally proved to myself that, yes, tactile pictures do matter in two basic ways. They offer a way for tactile learners to access and share information of any type, this can include emotional self expression or a map to the corner bakery. Art making is art making no matter who you are and art matters. In the last fifteen years I have made a lot of art and so have my students. We have all learned from the experience. What I would like to explore are some of the most intriguing elements of pictures that my students or I have stumbled upon. In no particular order here is the beginning of a growing list of questions that I would like to examine more closely, like animated pictures. I sculpted a rather large bas, or low, relief image of five life-size ravens. When I designed it, I saw it as five birds. When I carved it I thought of it as five. But when I hung it on the wall it spontaneously became one bird jumping and fluttering all around. I saw a picture generated in my head that looked like an hand drawn cartoon in white pencil on a black background. Is this something other people could experience? I teach perspective drawing at the Center through experience, not theory. It’s a fun class and the students are able to demonstrate the principles of perspective in pictures of their own imagination. But what I would like to explore further is the experience of depth-of-field in a very real way. I made a sample landscape illustrating different principles of perspective. I had overlapping hills, and a row of trees becoming smaller and higher in the picture plane as they receded from the viewer. The grass was more detailed in the foreground and less so as it approached the middle ground and then the back. The first time I showed this piece a number of us were startled when it suddenly transformed from a flat piece of plaster and felt like it opened up, like a book, into a full blown landscape. It even felt as though my hand was reaching beyond where the picture really was. Can I duplicate this experience and who can take that leap of faith? A number of students have independently added time elements into their pictures. After I noticed that, we talked about how we could use that and it seems like a fairly intuitive concept. I would like to explore that more too. At the Denver Art Museum we had a year of trying new techniques of tactile interpretation for paintings. At one point I started using lots of different materials that were frequently the same materials the painting were illustrating, like wood for window frames and satin for gowns. Other objects were represented by materials with very distinct qualities, like self-leveling liquid that dries with a high gloss finish to represent water and green sponge to represent distant tree foliage. I would like to explore how people perceive these pictures that are made like this more fully. I have seen evidence that some blind artist excel at proportions. It makes me wonder if touch isn’t the more reliable sense for that task. I think feelings, emotional, and feelings, touch are more closely tied than people generally consider. Just like inspiration and life are bound. Recently I stumbled on a phenomenon that a lot of people seem to easily experience. I made a 3/4 inch thick silhouette of a wolf and sculpted both sides as low reliefs. When a person would stand behind the sculpture and feel both sides at the same time not only could the see the entire sculpture at once but it also felt much more three dimensional than the low relief actually was. So this brings me back to why I am interviewing all these people. I think they might hold some keys to my questions and some ideas about how to explore further. I would like to see all this culminate in an exhibit that is interactive and even invites the visitors to participate in these experiments by sharing their experience. It would be nice to see you all there but even if you can’t get to the exhibit join in the conversation. And if you’d like to see it at a museum near you, let me know and who knows maybe we can make arrangements! People often wonder how tactile pictures are made. There are lots of different ways to make a mold for thermoform reproduction but the technique I use most frequently is to sculpt clay and then cast it in a heat resistant, flexible plastic. 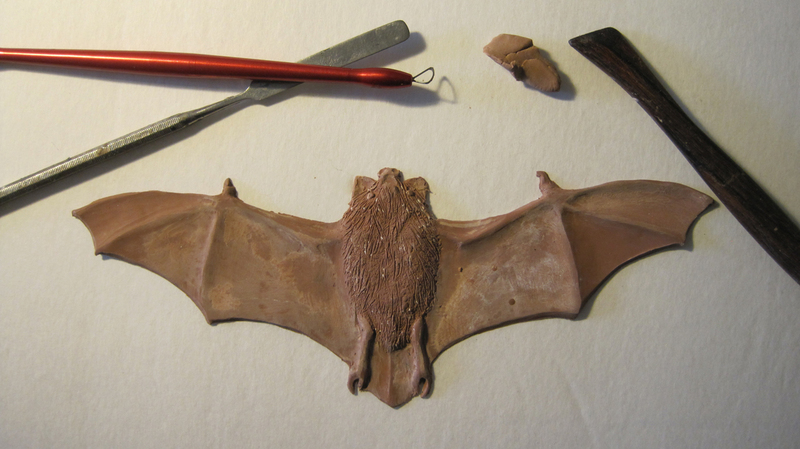 This is a photo of the finished clay model of a bat. It is very low relief. It shows the belly of the bat. 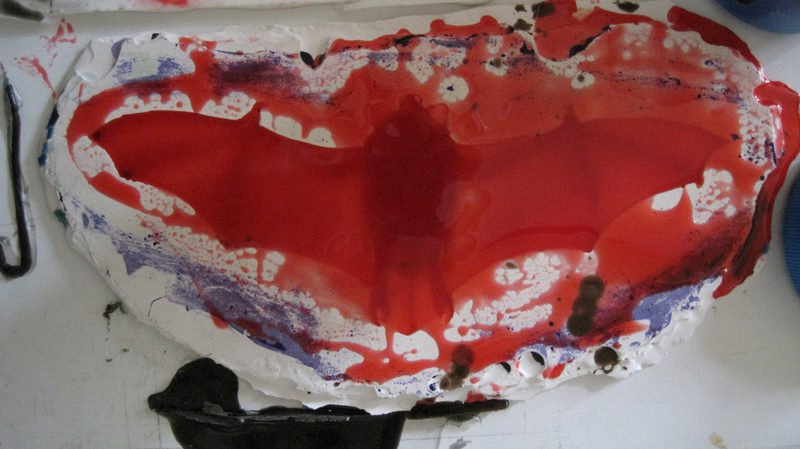 I chose this view of the bat because it makes the relationship between his mouth, eyes and ears visible. It also clearly illustrates his legs and wing structures. My favorite tools are shown. The micro spatula, which is a small stainless steel tool shaped like a round-cornered rectangle with a handle on it is to the left. The small clay loop is a wire loop attached to a handle, also on the left. On the right side of the picture is a small wooden clay tool with a diagonal cut on one end and a rounded form on the other. Once the mold is filled I level it off with the straight edge of a ruler. This is the messy part! Then it must sit for about 20 minutes while the plastic hardens. 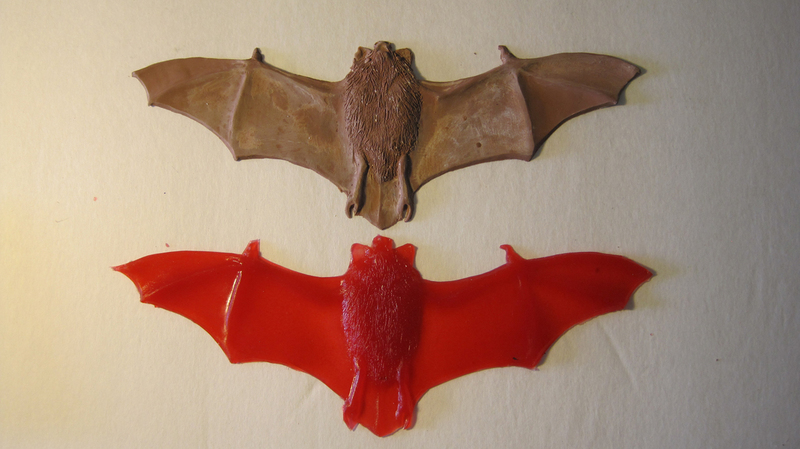 This plastic is thin and transparent enough to somewhat make out the body and the out stretched wings of the bat.